It's been a while since I wrote a Teaching Tools post, and was thinking today about handwriting instruction and how much I HATE it. I hate taking time that might be better used playing with play dough, legos, blocks, creative drawing, etc... and developing fine motor skills in a developmentally appropriate way. I hate that when I am introducing how to form a letter I can only catch a few kids as they form it incorrectly and I HATE that they come to me with bad handwriting habits already ingrained in them from helpful preschool teachers and parents who don't know how hard it is to over come motor memory. Finding ways to keep the group (and there's always a few) who have great handwriting busy or not bored out of their minds writing a, a, a, a, a, a... makes me crazy too. Handwriting is boring, requires tons of paper, workbooks- and I HATE work books in K, or white board markers, and ends up thrown away. I run around like a mouse in a maze trying to prevent or draw attention to improperly formed letters. Funny thing is, they don't even notice letters floating up the lines, or turned around, or started from the bottom, or missing a line...ARGH. Yet, the kids need to learn to form letters properly, especially as most are writing three to five sentences by June in my class. And I HATE walking by former students work in the hallways thinking, maybe if I took more time working on handwriting they'd be doing better in 1st, 2nd, 3rd, 4th, and 5th grade. So when I got my first iPad and looked at my first GOOD handwriting app I thought YES!!! This is why iPads belong in Kindergarten! Handwriting instruction and practice really should be done with a 1:1 teacher student ratio. It is impossible- in my opinion to do this in a busy class of 19 (current year), even 13 (one blissful year) and 28 (my largest class size). 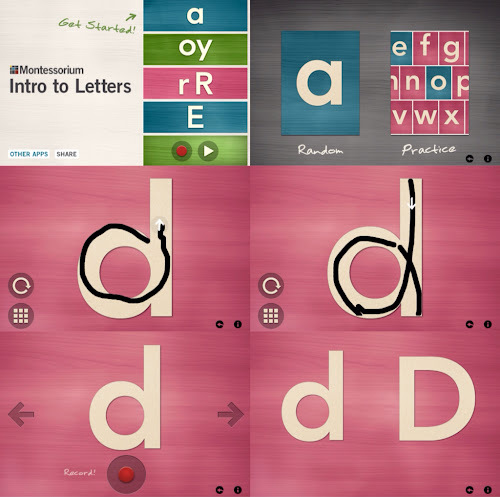 With the iPad and the right app, students can be taught correct letter formation at their pace, with support, feedback, and without me! For anyone who hasn't read one of my Teaching Tools blog posts I believe a technological teaching tool must meet the following criteria in order to be worth using. 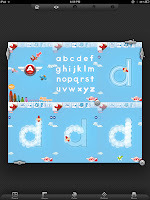 In the interest of making the apps easier to compare, I tried to use the letter d as a frame of reference on the apps. I will try to be fair. I believe I paid for all these apps or downloaded when free. To save space I made collages of pages from the apps (except the first as it was super basic). I tried to include option and settings pages, and any extras. 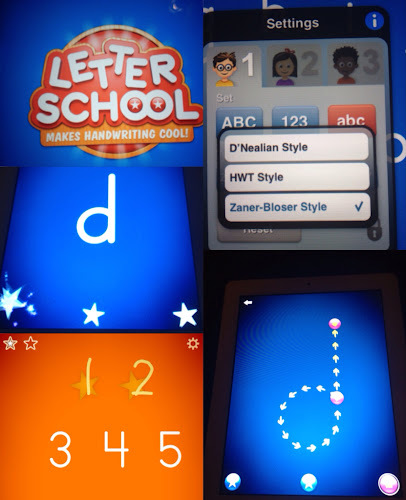 ABC Tracing is your basic, basic handwriting app, and is hardly better than a worksheet. Maybe it's not. At least my worksheets demonstrate where to begin the letter. This app doesn't. It doesn't correct mistakes or give support in writing. It does announce the letter name. It does show an object beginning with the letter (using short or long vowel sounds- a pet peeve of mine. Please stick with the short vowel sounds developers.) It is also a little difficult to navigate between letters. You swipe at the bottom and the letter displayed has to be in the middle arch. Bottom line- it's free. Better than nothing? I guess. I hope though, you'll try some of the paid apps below, some are definitely worth the cost. 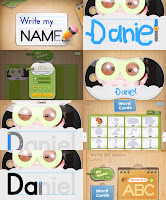 Write My Name $1.99 Write my Name is one of my newer apps and definitely a power house handwriting app. As it's name implies you can personalize the app with your child's name (as well as friends and family, or anything else you can dream up). It allowed me to put in 27 letters, so even Rumpelstiltskin could learn to write his names! I suppose you could also make a repetitive letter tracing tag; such as ssssssssssssssss. It has word cards built in (upper or lowercase option) with the incentive to write them and read the word by showing only a shadow until you've completed the card. I like that there are not negative feedback sounds (there's a little ding but not obnoxious) when you go off the track. There are arrows and little stars that show the proper starting place and direction. Bottom Line: Wonderful! I would definitely buy this for personal or classroom use (with VPP it'd be $20 for a class of 20 to use). 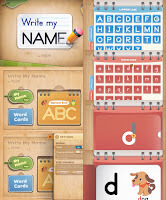 Blobble Write, FREE, with in app purchase for capitals, etc. I have Blobble Write on my class iPads. It's one that's free (lowercase letters and numbers 0-9 only) with option to buy capital letters, and a few other features. It is a little sensitive, but I like that it demonstrates how to write the letter/number and glows red if you go off track. My students seem to like it, and it's pretty decent for a free app. Bottom line: worth having, especially if you don't want to spend any $ on apps. I don't LOVE Write On, but I don't hate it either. Before Write My Name(see above) I loved that you could write names or sight words into it and kids could practice writing them.It doesn't give instruction on writing letters in words though, and only allows 8 letters (sorry Rumpelstiltskin or Stephanie). Bottom line: try the free version before buying the full to see if you like it. I wouldn't chose this over Write My Name. My daughter and students end up scribbling on the page since it allows it. 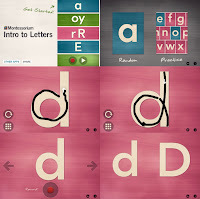 Intro to Letters, $4.99 The price is steep, but the app is beautiful and could be useful. I like the quiet sounds (letter sound /d/ at beginning of trace. Vowels are highlighted blue, mistakes are allowed, but only to a point. The app also offers letter blends (oi, oy, ai, etc as well as sh, th, wh) practice. It has a flashcard like option, it shows capital D says letter name, lowercase d, says /d/. My favorite part is the last option- it shows you the letter, says the sound, and then has you record and say the sound. 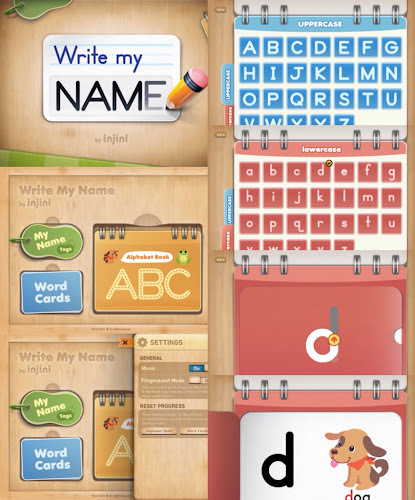 Bottom line: too pricey for my classroom iPads but a nice beginning letter writing app and phonics program for my personal iPad and my 3 year old! 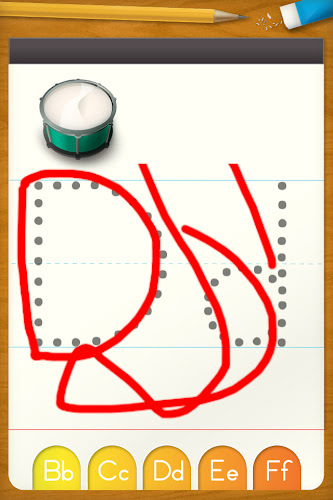 This was one of my first handwriting apps, and I can't help but like it still (that crab and the squeaking noise he makes when you mess up are cute). 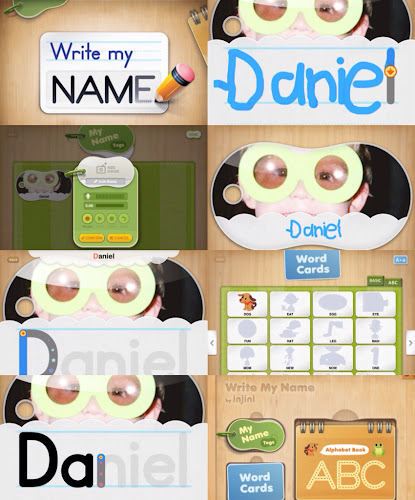 It has options for capital and lowercase letters and words, as well as numbers. It is one of the few apps I've seen that lets you adjust the size of the object you write. I like that. It doesn't require you to start from the beginning if you make a mistake, but it makes you touch each point on the letter before continuing. Bottom Line: Try the lite version first, I do like it but it's not my top pick. Another early letter formation purchase for me, this app was disappointing in my opinion (although I believe an update is in the works). It does the basic capital and lowercase letter formation follow along but that's it. They added a letter and word pronunciation but you have to click the icon in the top corner- ideally the pronunciation would happen automatically so kids see, hear, and trace at the same time). Bottom line: For the price I still have to say go with Write My Name, If your tyke loves planes maybe it's for you though, and I am curious to see what they add into the update. They also have a new product coming out soon called the App Crayon. I am looking forward to trying it out in my classroom. 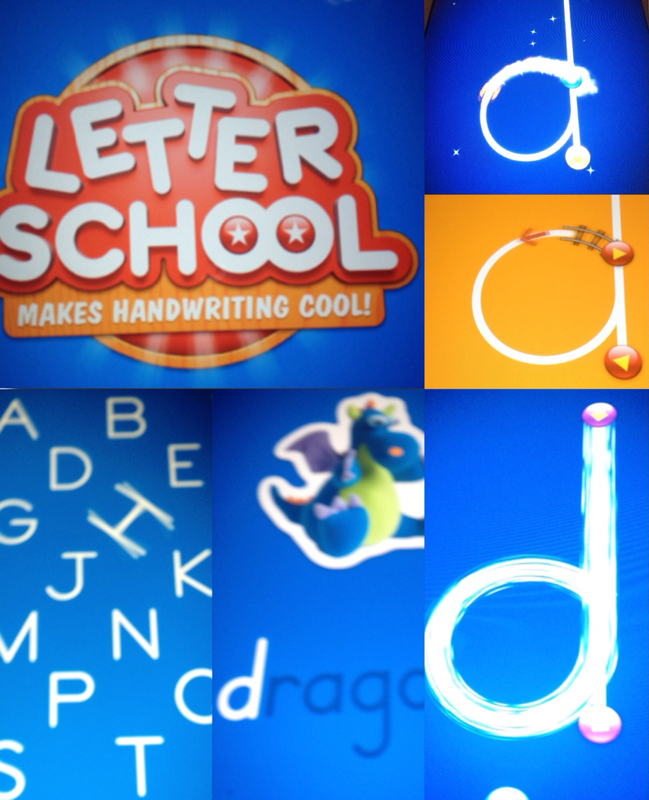 My latest app acquisition, Letter School, $2.99 is what got me thinking about the qualities of a good handwriting app. 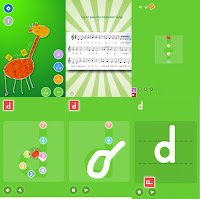 This app focuses on correct formation in a playful, thoughtful way. It focuses on where you begin the strokes and emphasizes correct form It has limited spoken support (nice for encouraging no or low volume), but pretty loud sound effects. Instead of saying click on the... instead what is supposed to be touched bounces or flips (note the H in the picture of the ABC's). 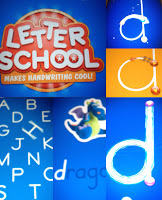 Once you pick a letter or number it announces "This is the letter d for d, d, dragon". 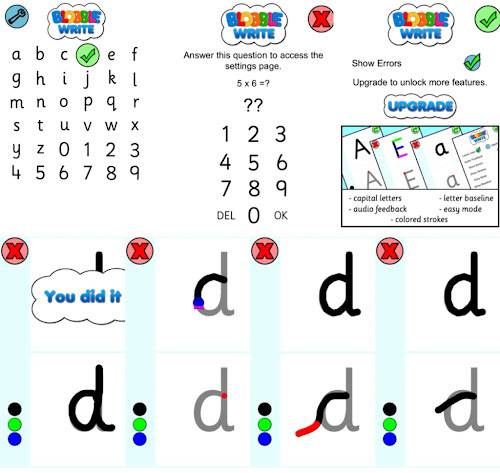 Then the child goes through three steps: touching the correct start point and watching the letter strokes with a cute animation. Then the child touches the points and traces the letter, pulling train tracks, lights etc which animate when completed. I like that after a few incorrect starts support is offered- Middle d in top picture. Then the child writes the letter interdependently- as soon as the touch the start points the form disappears, but if the child doesn't know where to go supports pop up (bottom picture d with arrows. After the user finishes all three tasks a star is placed on the alphabet page. 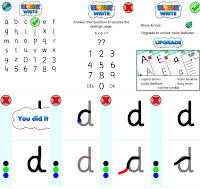 Once all the capitals, lowercase, or numbers are completed three new levels open up for children to trace, with new animations. What I especially appreciate about the app is the choice of zaner-bloser, d'nealian, and even HWT (handwriting with out tears) letter formations. Bottom line: Good app! Get it for your family and for your classroom if you can budget it in. I haven't decided yet if I'll buy it for my class. Perhaps you worry about kids learning letters using finger tips rather than pencil grips- I say don't! You can make your own conductive iPad pens using old markers, conductive wire, conductive sponges and duct tape. See my instructions, below from an earlier post. 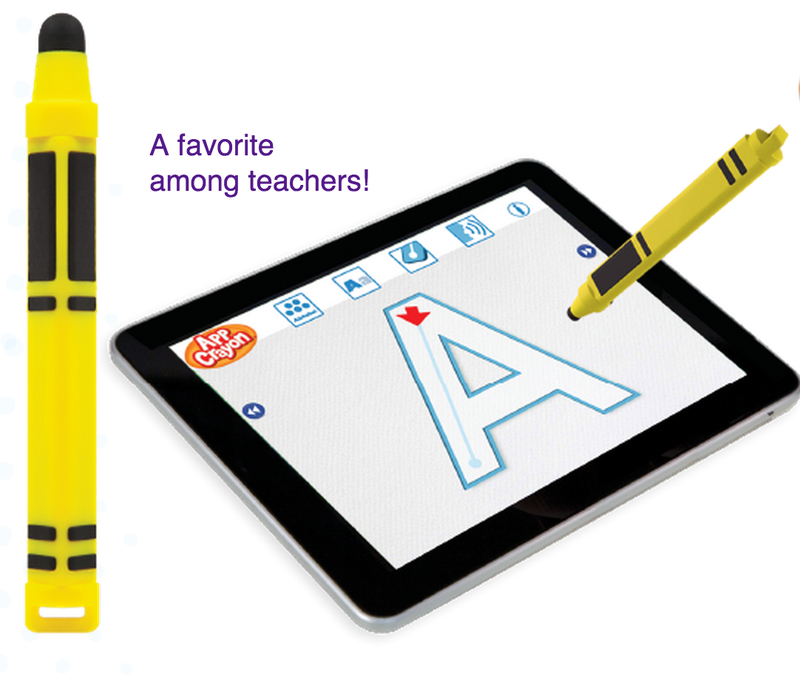 My students use them for writing with the iPad. A terrific review, thanks. I've shared it on my business Facebook site https://www.facebook.com/HisNibs1. Thanks for taking the time to compare all these apps! Very helpful! Thanks for the reviews! I'm just starting to incorporate the iPad into the classroom at this level and hope it goes fantastic!